First off, let me apologize for the past two and a half weeks of absenteeism. I started off the new year with a 1-post bang, and promptly got totally distracted and left you all to your own devices for almost three whole weeks. I’ve missed TWO Cupcake Fridays! I’ve failed you. But don’t give up on me yet. Let me make it up to you! Today’s long-awaited cupcake is brought to you from Framed Cooks, a blog I’ve been following for quite a while because of the incredible recipes and amazing leaping girl in the header image. Gingerbread is one of my favorite things, but gingerbread cookies are typically harder than I want them to be – I’m a big fan of the soft and chewy cookie, not as much the snap (although don’t get me started on Trader Joe’s Triple Ginger Snaps” – best snack ever). 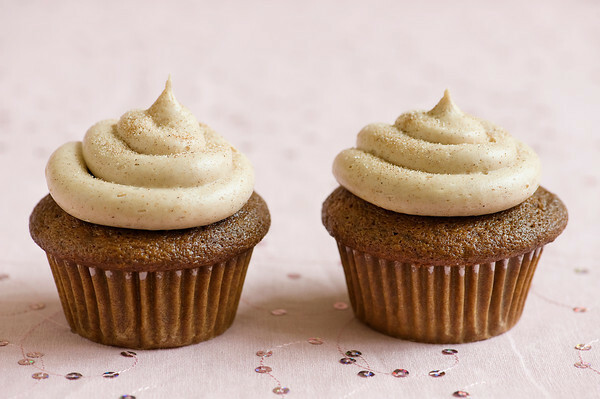 So gingerbread cupcakes seem like the perfect solution – guaranteed to be soft and fluffy, and conveniently served with frosting! What are your favorite gingerbread things? Happy Friday everybody. :) Turns out I never posted my Halloween cupcakes post, and how better to celebrate the coming weekend? So here they are! Halloweeny pumpkin cupcakes with pumpkin-cinnamon cream cheese icing! Inspired by Katie, created by Miz Purple, iced and eaten by Helper Hubby.